Understanding encoding is all fine and good, but there are many gotchas involved in actually building a complex system consisting of many moving parts that uses anything but ASCII characters. This article shows how to get a PHP web application with a MySQL database set up to handle UTF-8 data front to back and explains common pitfalls. Une bonne journée, tout le monde! Một ngày tốt lành, thế giới! Please do not quote me on the accuracy of these Google translations, but it'll suffice for our testing purposes. If the text ever appears any different at any stage in your app, you have an encoding problem somewhere. Make sure you are actually testing your app with non-ASCII, non-Latin characters. Even a string containing "funny squiggles" found in European languages may not accurately show you whether you are correctly using Unicode; only text that contains characters from all over the Unicode table will. The goal is to hardcode this text in an HTML/PHP file and have it display correctly in the browser. Further, we want to allow a user to input this text in a form, save it in a MySQL database, retrieve it again from the database and display it back on the page. The text should be stored correctly in the database, so when looking at the database content in a database admin utility or when searching for content, it will be displayed and found correctly. Text is exchanged as binary data behind the scenes. This series of bits and bytes may represent anything at all; what exactly it represents depends on the encoding it was created with and which it is interpreted with. Since the text itself does not specify what it was encoded with, this information needs to be transported as meta information between different systems. text/html is the standard MIME type for HTML pages, the additional charset= directive informs the browser which character encoding it should expect the document to be in. If this was set to application/xhtml+xml instead, the browser would fire up its strict XML parser and try to parse the page as X(HT)ML. If it was set to application/pdf, it would try to render the page as a PDF document and so on. These tags are only fallbacks though which are only used when no HTTP Content-Type header was encountered (the wording "http-equiv" hints at this). It's also conceptually weird, since these tags are inside the document itself and the browser needs to read the document first in order to figure out what kind of document it's dealing with. These two declaration together make it explicit to the browser in which encoding to communicate with the server. The client may also send an HTTP Content-Type header of its own, denoting the type of data and encoding that it sent to the server; this value can be found in the $_SERVER['CONTENT_TYPE'] variable. For form submissions this usually is application/x-www-form-urlencoded without charset attribute. This actually represents a problem, since the encoding to be used for application/x-www-form-urlencoded data is practically undefined. Therefore, if a browser does not heed the accept-charset form attribute and sends data in some other encoding of its choosing without specifying the used encoding in the Content-Type header, all bets are off. The good news is that all browsers you will encounter in practice today are behaving properly in this respect. The actual column that stores the text is set to the latin1 character set. So any text that is stored in it will be stored in the latin1 encoding. This means this column can't store anything but the 256 characters defined in the latin1 encoding (a.k.a. ISO-8859-1 a.k.a. CP1252). The first thing then is to make sure that either all defaults are set to use utf8, or that at least the individual columns are set to it. Note: The database server has a default character set, a database can have a default character set, a database table can have a default character set and finally the column has a character set setting. The rule is simple: if no explicit character set is specified for a column, the next higher default is used for it. The server, database and table defaults all have no influence whatsoever if the column has an explicit character set. The next thing many people seem to be confused about is the collation setting. This simply refers to the rules governing character comparison. For example, it specifies how entries are sorted when ordering them alphabetically. It also specifies whether some characters should be regarded as identical when searching text, like whether a search for "matinee" should also match "matinée". Most collation settings also come in normal and _ci variations, where _ci stands for case insensitive. Which collation to choose hence depends on what the column is supposed to be used for. For a column that stores user names, you probably want to be very strict and use the binary (_bin) collation for your chosen character set, which only matches if two strings are identical. If you want to conduct freeform text searches on your database, you'll want to go with something more lenient to get more flexible search results. 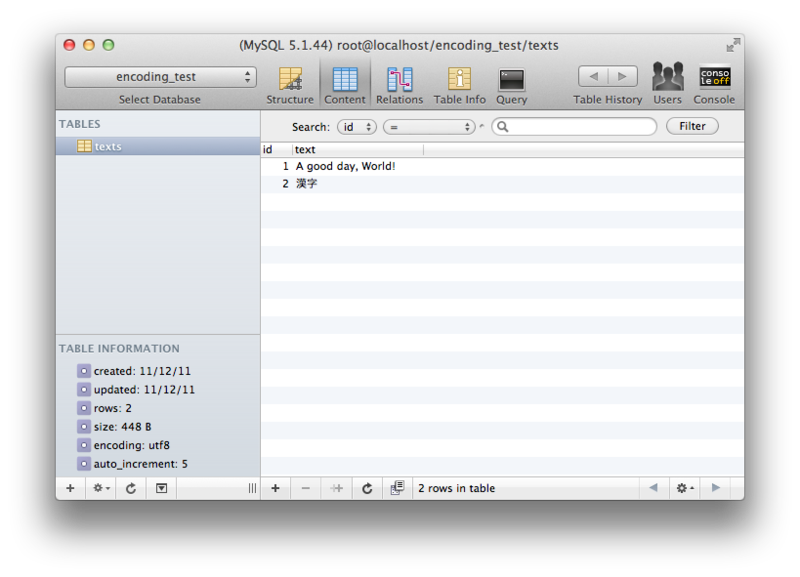 OK now, when querying data from the database, what encoding will it be returned in? When sending data to the database, what encoding should it be in? The answer is: it depends. On the server and client settings, that is. You can read the in-depth explanation of what influences what in the MySQL documentation. The upshot of it is that in practice it often defaults to latin1. So when sending data encoded in UTF-8 to a database expecting Latin-1 encoded data, the database will misinterpret the received data and convert it to something else. Even with the database, the table, the column and all collation defaults set to UTF-8, you still won't be able to properly store UTF-8 data in it, because the connection defaults to latin1. The first method specifies the charset to use in the connection string. Note that this only works since PHP 5.3.6. The second method makes sure that the SQL query SET NAMES utf8 is run after connecting to the database, which sets the necessary connection settings on the database server. The third method more or less does the same for the older mysql client (which you shouldn't use anymore, really). the client, oblivious to all of this, expects UTF-8 encoded data and interprets the bytes in UTF-8, which happens to evaluate to the text "ëñcødîng"
Therefore, you may have a transparent round-trip of UTF-8 data through the database, but the data is actually stored incorrectly in the database. This is important if the database is supposed to do anything with the text, like conduct searches on it, index it or even manipulate it. It also causes problems if you eventually do connect to the database using the correct encoding, since you'll then figure out that all your stored data is actually garbage. There should be no encoding conversion at any point along the chain browser → PHP → database → PHP → browser. Copy and paste this into a .php file, edit the database connection settings as necessary, create the database as shown above, make sure to save the file as UTF-8 and open it in your browser. 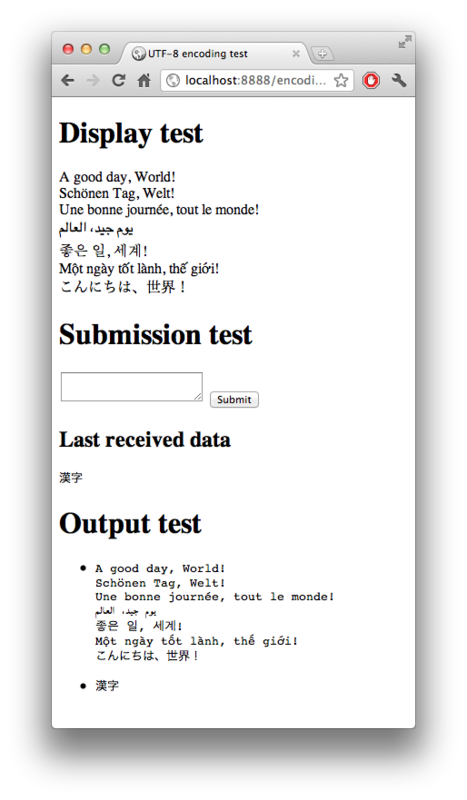 Feel free to input any data into the form or copy and paste the text from the display test for a good test sample. Is the text editor saving the source code as UTF-8? If not, the display test will screw up. Is the browser submitting data as UTF-8? If not, the "last received data" will screw up. Is the round-trip to the database working properly? If not, the output test will screw up. You should additionally use your favorite database administration tool to look at the data as it's stored in the database. David C. Zentgraf is a web developer working partly in Japan and Europe and is a regular on Stack Overflow. If you have feedback, criticism or additions, please feel free to try @deceze on Twitter, take an educated guess at his email address or look it up using time-honored methods. This article was published on kunststube.net. And no, there is no dirty word in "Kunststube". Handling Unicode Front to Back in a Web App by David C. Zentgraf is licensed under a Creative Commons Attribution-NonCommercial-ShareAlike 3.0 Unported License. Last updated on Monday, January 13th, 2014.